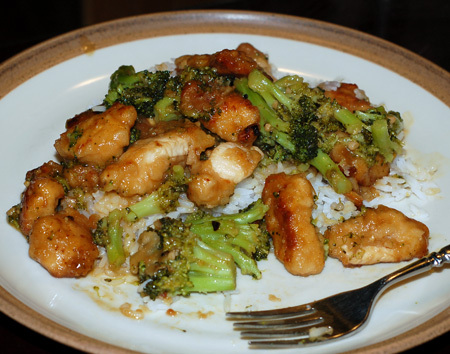 I’ve been trying for a while to track down a recipe that emulates the orange chicken from Panda Express, which I’m sure is loaded with fat, corn syrup and other naughty things. This recipe comes pretty darn close to that sweet-heat flavor and crisp-gooey texture, and I’ve already made it several times. I did make a few slight adjustments, most notably orange juice concentrate in place of the orange juice, which kicked up the orange flavor markedly. When I had no more orange juice concentrate, I made it myself just by boiling down about 1/2 C prepared orange juice to 2 T before adding the rest of the sauce/marinade ingredients. I also omitted the green onion and substituted dried orange zest and some chips of dried ginger in place of fresh; they imparted plenty of flavor as the marinade cooked. As for the chicken, I am rarely organized enough to know what I’m making for dinner hours in advance, so my chicken just marinated for about half an hour. I use a Tupperware container for that, and also to shake it with the flour so I don’t waste a Ziploc. I also just throw all the marinade in with the chicken instead of separating some for the sauce; it boils down at high heat afterwards, so I don’t worry too much about contamination. I also added some lightly steamed broccoli to the dish at the end, just in time to toss with the chicken and sauce. Pour 1 1/2 C water, orange juice concentrate, lemon juice, rice vinegar, and soy sauce into a saucepan and set over medium-high heat. Stir in the orange zest, brown sugar, ginger, garlic, chopped onion, and red pepper flakes. Bring to a boil. Remove from heat, and cool 10 to 15 minutes. Place the chicken pieces into a resealable plastic bag or container. When contents of saucepan have cooled, pour 1 C of sauce into bag. Reserve the remaining sauce. Seal the bag, and refrigerate at least 2 hours. Wipe out the skillet, and add the remaining sauce. Bring to a boil over medium-high heat. Mix together the cornstarch and 2 T water; stir into the sauce. Reduce heat to medium low, add the chicken pieces, and simmer, about 5 minutes, stirring occasionally. I love orange chicken from my local Chinese restaurant and it’s been on my list of recipes to adapt for home. I was so glad to find your recipe. Looks delish! Can’t wait to try.